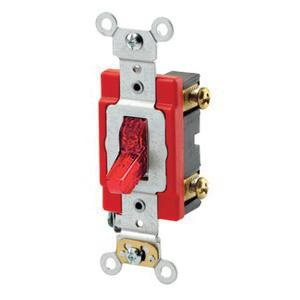 Leviton 1-Pole Pilot light toggle AC Quiet switch in red color, is rated at 277-Volts and 20-Amps. It has maximum load capacity of 1 hp at 120-Volts. This industrial grade switch features thermoplastic construction. It measures 4.06-Inch x 1.31-Inch. Switch with back and side-wired connection, accommodates terminal of size 14 - 10-AWG and 14 - 12-AWG. It withstands dielectric strength of 1500-Volts. Pilot light toggle illuminates when load is ON. Fully enclosed switch mechanism ensures better strength, track and arc resistance. Box mount switch features silver alloy contact to offer long life, prevent sticking, welding and excessive pitting. It features 0.48-Inch thick galvanized steel strap. It withstands temperature rating of -40 to 65 deg C. Switch is UL listed, CSA certified, RoHS compliant and meets Federal specification/NEMA/NOM/ANSI standards.